Though I’m not typically one to miss an Apple event, I found myself on a New York-bound plane Tuesday as Apple unveiled its latest creations. Thankfully, I was flying Virgin America, which has Wi-Fi on every flight. So, like many people, I was tuned into various liveblogs (including, of course, our own). Being up here gives a little distance and perspective. So, pardon the pun, here’s my 30,000-foot take on what Apple announced, and how it fits in with some other things going on in the industry. 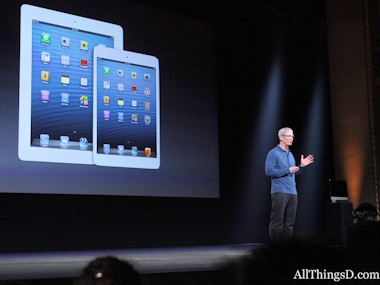 The iPad mini was the expected star of the show, and it arrived as the final product, though with few surprises. Apple kept the same aspect ratio and pixel count as the iPad 2, so the mini is all set to run any iPad-optimized apps. Apple isn’t competing aggressively on price — selling the Wi-Fi-only model for $329, well above tablets such as the Kindle Fire HD and Nexus 7 (not to mention a host of other small Android slates). Still, Apple did lower the bar slightly, with the mini selling for $70 less than the cheapest full-size iPad 2. Apple also introduced an updated fourth-generation iPad that should upset some who thought “the new iPad” wouldn’t become “the old iPad” quite so fast. For all other buyers, they are just getting more bang for the buck — along with the new Lightning connector. That’s a good thing for the future, probably, but, as with the iPhone, it’s a pain if you have lots of existing iPeripherals. On the desktop Mac side of things, Apple revamped its two main models — the iMac and Mac mini. However, Apple plays in only in a couple segments of the desktop market. For those looking for an all-in-one, the iMac got thinner and more powerful, employing a hybrid drive that combines flash and hard-drive storage. Here, the iMac will find itself up against a host of touchscreen Windows 8 all-in-ones. Apple continues to make the case that touch is best served on tablets, and that when it comes to the desktop, a nice trackpad will do the trick. Acer, Hewlett-Packard, Dell, Lenovo and everyone else will be making a different case, as they add touch to lots of their models — particularly tablets, all-in-ones and convertibles. As for laptops, Apple added one new model to its lineup, introducing a 13-inch MacBook Pro with Retina display, offering those who want the high-end screen in a more compact and slightly less pricey machine. As with the 15-incher, choosing the Retina display gets you a thinner, lighter laptop, but at the expense of an optical drive and a bigger hit to the wallet. Well, it’s about time to fasten seat belts and turn off electronic devices. That gives me just enough time to ponder which devices might be finding their way onto this year’s holiday shopping list.